And so at about seven, we all began to rise. With the exception that is, of Don Geldart and Julia Stone. I expect Don was exhausted by all the exercise his stomach had put in recently. We all drifted off in various directions, and I ended up with Mike Moorcock and Mary Reed. I had to wake up Charlie and two others, and Mike and Mary came round to help me do it. After thumping on Charlie's door for about ten minutes we were finally satisfied that he was up, and carried on our way. Desmond Squire and Peter White, we woke in our own particularly sadistic way. We got Mary to stand outside the door, and after knocking, to say, "Early morning tea, sir". Then Mike minced into the room. A more horrible way of waking someone up, I can't think of. On our way back we ordered a pot of tea for us to drink on the landing, then when Charlie had joined us, and the tea was drunk, we made our way down to breakfast. I ordered poached eggs on toast, and got back two things that, side by side, looked most obscene. What was worse, Mary kept urging me to stick my knife into them, a thing I just could not bring myself to do. Eventually I plucked up courage, and violently stabbed them. The sight of the yellow yolk, oozing slowly out, put me off poached eggs for the rest of my life. After breakfast, Charlie and I arranged to meet the others at the door, to go out shopping. It was strange going out into the open again, and the cold morning air seemed most hostile. We wandered about a bit, not going anywhere in particular. By now Saturday's programme had begun. The first item was marked in the programme as 'Does Fandom need SS?" , but not wishing to know whether or not fandom needs the secret service, we didn't worry about missing it. I woke up with a hangover, which obviously had been brought on by the fact that I'd broken all the rules of stomach care the night before by having crispy noodles instead of my usual soft noodles. Sometimes I think I'll never learn. However I quickly cured the hangover by a trick picked up from a German friend who on these occasions always takes an Alka-Seltzer and an aspirin tablet - typical two-tonic efficiency. 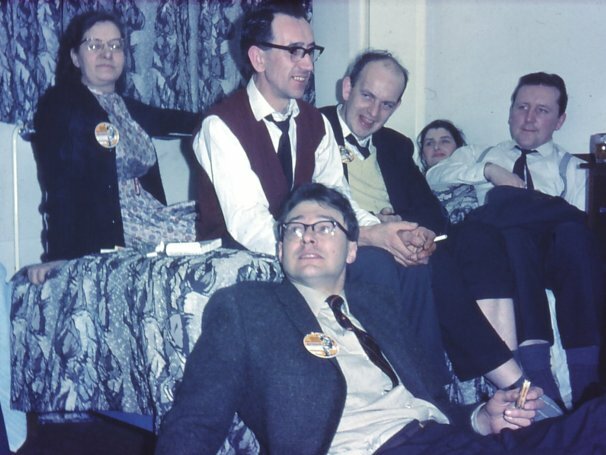 One of the first things to happen that day was that Arthur Thomson turned up and I brought him along to our room and introduced him to Sadie, the one member of Irish Fandom who had so far eluded him. I was pleased at the great interest Arthur took in Sadie. They had almost met on several occasions during the previous ten years or so and he couldn't seem to get it into his head that at last she was really there in front of him. In fact, at odd moments during the convention, when he thought nobody was looking, Arthur kept putting out his hand and just touching some part of Sadie - her back or her leg, perhaps---as though to convince himself she was real. I had to laugh at old Arthur for being so slow on the up-take. Now that I think of it, Ian McAulay was another one who was very nice to Sadie. Quite often, when he could have been away talking to faneds or buying prozines, he seemed content to just stay with Sadie on our bed while I selfishly lounged in the room's only comfortable armchair. Several times he told me there was absolutely no need for me to miss any of my first British convention for some years, as he wouldn't mind keeping Sadie company for me while she rested. I didn't take advantage of his offer, of course---there are limits even to what one fan should be allowed to do for another. It ought to go on record, though, that it is people like Arthur and Ian who have helped make conventions what they are. Wally Weber, Ethel Lindsay (el). The Saturday morning programme opened at ten with a panel discussion on the topic, 'Does Fandom Need Science Fiction?' Surprisingly the panelists themselves, Chairman Ron Bennett, Arthur Thomson, Phil Rogers, Terry Bull and TAFF delegate Wally Weber, showed up as being anything but the experts they are reputed to be and decidedly the majority of speeches came from the floor where also the main points were raised. Phil Rogers felt that fandom does not need sf. Terry Bull pointed out that sf brings fans together but after the initial meeting their interests widen out. Arthur Thomson finds that sf needs fans and fans need sf. Wally Weber said that fandom needs sf as a recruiting device. Ken Bulmer noted that sf editors can run into trouble if they take notice of fans, the shrill minority, which caused Atom to note that if fans are the shrill minority then the authors are the shill minority. George Scithers who was on the Committee of last year’s Washington D.C. Worldcon (the DisCon) and who is now stationed in Germany, noted that fandom has been a source of providing many professional authors to which Ken Bulmer stated “Your innocence has gone forever once you have made a sale.” Ron Bennett reminded the audience that one reason for the founding of the BSFA was to recruit fans for fandom. Jeff Cooper from Cambridge noted that present day sf lacks the literary elan of the sf of the late thirties and James White rightly pointed out that there would be no fandom at all were there no sf to begin with. Charles Platt said that fans are boring when they don’t talk about sf. Phil Rogers felt that there was more to fandom than this. He enjoys reading westerns but he wouldn’t join a western club, therefore he must have joined a sf club for more than sf. Ken Bulmer pointed out that the attitude of a fan who had read much sf is different from that of a neo who is reading sf for the first time. 'Does Fandom Need SF?'. The more pertinent question of whether sf-reading fans needed fandom was only hinted at. The panel was two-fifths asleep, judging from the small amount Terry Bull and Wally Weber had to say; in fact since Wally Weber openly stated he didn't want to say anything one wonders why he took on the job. Panel members managed to say the same thing but make it sound different each time, and most of the relevant discussion points raised in the audience (there were many irrelevant points) followed the same theme. High spot in the discussion was when the panel was found to be composed of three people who were not regular readers of sf; and the other two didn't seem too sure about it. After some beautifully incomprehensible remarks from the audience, with no summing up from the chairman or the panel the conclusion was reached that there was no conclusion. Auctioneer this year was Ted Forsyth of the SFCoL. With the gavel for the first time at a convention, Ted won plaudits for the brisk manner in which he moved the lots. Together the audience realised £32 10s for Convention funds, a percentage of which will most certainly be going to TAFF. Saturday afternoon's surprise item took the shape of Mr & Mrs Edmond Hamilton answering questions fired by the audience. Ed Hamilton said that the pace of Battle for the Stars was much slower than, say, The Universe Wrecker because it had been expanded from a short story. Leigh Brackett – yes, Mrs Edmond Hamilton (we, too, have neo-fan readers) – mentioned that Planet Stories was thought to be a poor magazine while it was running; the moment it folded people began to praise it. EH said that the pocket book is taking the place of the magazine. Both EH and LB felt that the pulp would never return. Asked about their first interest in sf, Ed said that he began to imitate Merritt's style through admiration and found that it sold. Leigh said that at school she was good at expressive work, tried pro writing at 13, didn’t sell for ten years. Ed felt that more factual work will be written. Jim Groves pointed out that more scientists are now writing sf. Ed answered a question from Ethel Lindsay, that his favourite self-written story was 'What’s It Like Out There?' which was written in 1933 and sold thirty years later. Leigh likes 'The Long Tomorrow'. Of each other’s stories, Ed likes Leigh’s 'The Fall of the Free Winds' and Leigh likes Ed’s 'What’s It Like Out There' and 'The Star Kings'. Sid Birchby told of being given a copy of The Star Kings by Ted Carnell only to find that the book was the French edition. He bought a French dictionary so that he could read it and had thoroughly enjoyed it! John Roles asked about a Hamilton anthology which had appeared in the UK, 'The Horror on the Asteroid'. Ed said that there was no US edition and that the book must be pretty rare by now. This collection of stories from Weird Tales had been his first hard cover book, though the royalties had been so small that he had been paid in postage stamps. I wonder whether the 'surprise item' at 4pm had been planned in advance, or was simply an unfilled space on the original programme to be filled up with anything that happened to show up. The anythings that showed up turned out to be Edmond Hamilton and Leigh Brackett . It was a pity that the questions posed to them continued for quite so long, but considering it was all unprepared the husband-wife team made some very interesting and absorbing comments. It is strange that this interest and intelligence does not show up in most of the stories they write. There was a surprisingly large number of good costumes at the Fancy Dress Ball on Saturday evening. Eddie Jones should have got a prize for his: "The Original Kelly Freas", a reconstruction of what Freas used to dress his swashbuckling characters in when he was illustrating Astounding. The execution was perfect, and Eddie fitted the part so well... The award for 'most beautiful costume' I regret was influenced by the inherent cuteness of a small child; it would have been better if the costume rather than the person involved had been considered. Saturday evening found a bar erected in the con hall with home made brew provided by the Merseyside Winemakers’ Society flowing freely for all comers. 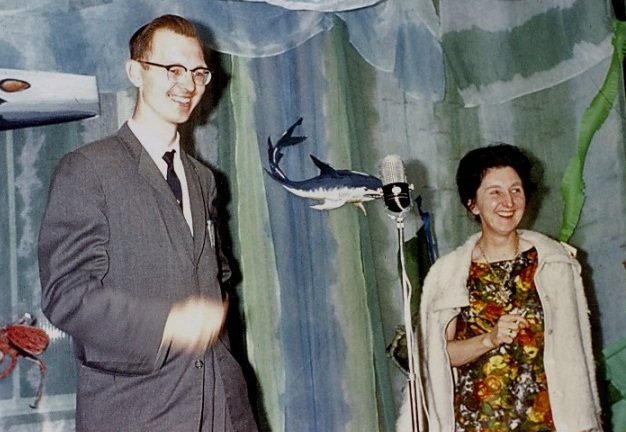 The fancy dress competition was judged by Leigh Brackett, Edmond Hamilton and Michael Moorcock against the undersea theme backdrop which had been designed by a highly talented twelve year old, namely Ken Slater’s son Michael. rocket on far left. (pm). For some reason the Alien crowd decided to get their costumes on about an hour too early. We sat around sweating under tons of make-up, papier-maché and crepe hair. Eventually the room began to fill up and things got under way ... but whoever was supposed to have checked the start time in our lot had better keep quiet about it! Turnout for the competition was a vast improvement on last year, and it looks as though the many appeals in the Con newsletters during the year had had some effect. Charles (Partington) ran into trouble with his make-up, for he had his face built up with nose-putty to cover over his eyes and a pair of mirror-surfaced sunglasses in his guise as a 'Selenite'. This worked very well in his bedroom lighting, but in the Con hall, where the lighting had been dimmed, he couldn't see a thing ... his glasses had misted up on the inside! Oh! well, he'll know for next year. Ian and Betty Peters of London took the prize for most authentic SF character as Fafhrd and the Grey Mouser, Susie Slater for the most beautiful costume as 'Princess of Zei’, and Harry Nadler for the most bemmish as a B.E.M.! Tony Walsh was not actually entered in the competition. Still I guess he deserved something for sweating away inside a six-odd foot replica of a rocket. He gave his prize, a bottle of booze, to the judges. There were many fine costumes there, that deserved prizes, even if they didn't get them. Among these was Simone Walsh, who was looking very beautiful in what appeared to be a completely home-made costume. I commented that after seeing Simone like that, Tony would want her to dress like that all the time. She said that he did, and commented that it was strange that people should say she looked so nice, when in fact she was made up like a tart. It is strange when you think about it, that at a fancy dress party, a girl can make herself up like this, and yet if she walked out into the street like it she would probably receive glances of condemnation from most people. I think one of the most horrifying sights I have ever witnessed in my life, was Burgess' naked stomach, as dressed in a pair of nearly knee-length underpants, he masqueraded as one of the nudists from Glory Road, I had often wondered just why Oscar should have left the sunny pleasantness of Levant, to go off on dangerous adventures. If the nudists looked like Burgess did, I am not surprised. After this, I had a few words with Charles Winstone, and after he left Julia Stone came over. I remember her asking me if I were a Beatles fan. When I said no, she said, "Oh, then you're a Dave Clark fan." When I declined this status she started reeling off a lot of names, with me shaking my head at every one. Finally I admitted I was a fan of Fred Schoenberg and his Frantic Five, and left her to puzzle it over. 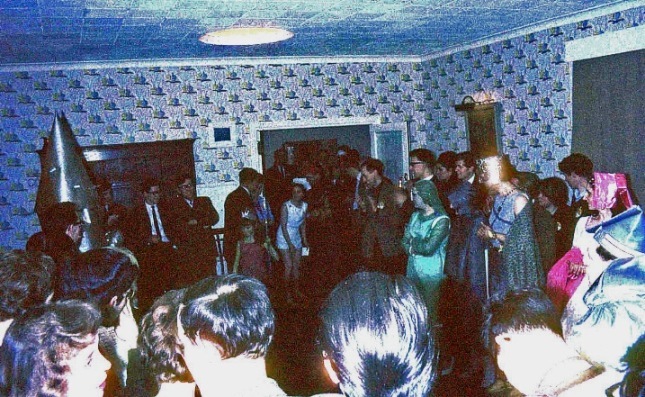 After the party, probably the most successful social occasion during the whole Convention, cliques gathered in the downstair-lounge, parties started in various rooms, drunkards roamed the corridors, rooms were broken into by a phantom inebriate with a master key. The white glare of flashbulbs successfully blinded several fans. 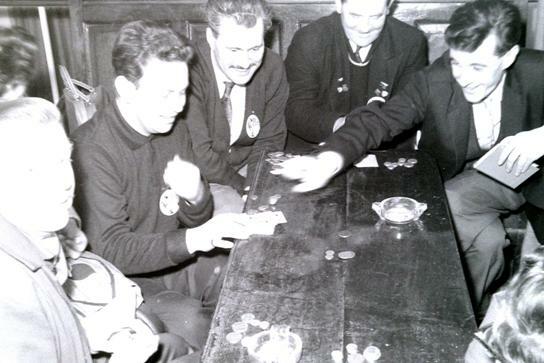 While neofen grumbled morosely about the lack of organisation and the lack of sf interest in older fans, the older ones smoked pipes and played cards on the landing and in the lounge. Michael Moorcock assisted as always by his London group of hangers-on, spent the evening crooning and bellowing into a microphone, revising the bible, climbing over the roofs, and generally making a nuisance of himself. The parties were fun... yes. But there was a continual feeling that the Fun was a trifle unnatural or forced. I wonder how many people enter fandom as in escape; correspondence can so easily and successfully disguise the social outcast or introvert, enabling him to become whatever sort of person he pleases, until his correspondents meet him — and so often find that the person they have been writing to is not what his letters sounded like at all. 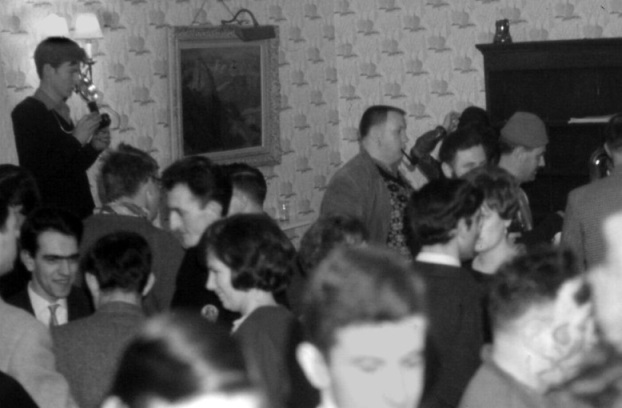 I would guess that in most cases the image of himself that a letter-writer builds up is more glamorous than he really his; consequently it is hardly surprising that the social atmosphere was 'forced' on Saturday night, with natural introverts trying hard to be extraverts. There was a slight feeling of 'why I am I staying up for this?' and indeed it seemed the main reason was, 'because everyone else is'. Arthur had not booked a room in the hotel and was spending the night on the floor of the room occupied by James White and Ian McAulay. It wouldn't have been much of a night for him at the best of times, but on this occasion there were two other factors involved---either of them devastating on its own, the two together being too horrible to contemplate. James had been quite ill before leaving Ireland with the result that his insulin dosage was all haywire and he was rapidly becoming delirious; Ian had tanked up on about ten different varieties of free wine to the point where pink elephants and green rats were running away from him screaming. Arthur tried to describe it the following morning but I doubt if he could have done so even if he hadn't been mumbling incoherently, twitching and flinging his arms over his face every time a door opened. We can only visualize him sitting bolt upright at the foot of James's bed, his head turning gopher- like as, hour by horrible hour, the night unfolded its vistas of dread. Now, I'm the first to admit that I snore a bit, but my snore is a regular peaceful thing which has even been known to soothe people and give them a feeling that the world mustn't be too bad if a man can so obviously enjoy the sleep of the just. But James and Ian both have frightening, unpredictable snores, sometimes dying down to sibilant whispers which lull the listener to a state of uneasy drowsiness, then with the suddenness of a bomb-burst increasing to thunderous proportions, wringing moans of panic from the listener who, with heart stopped, springs back to full consciousness. As if this were not enough, even when they are snoring at full blast one cannot relax in full submission for, without warning, a tremendous blast will be choked off in its infancy as some nasal passage, driven beyond its natural limits, snaps closed. There is a deathly silence followed by a series of silly clicks as various membranes are tested by the pent-up forces of the snore and finally, after an unendurable wait, it penetrates the original channel with redoubled fury or, baulked of its natural egress, explodes through the mouth in a hideous multiple vibration involving lips, teeth, gums, palate and tonsils. One can only guess how Arthur must have felt, after hours of this, on making the discovery that the inhuman repertoire was far from exhausted. James began to jerk about in his bed, his gigantic form thrashing in the near-darkness like a harpooned whale while tortured fragments of songs escaped his lips. And who can say what Arthur must have thought when Ian began bounding past him in the dark, looking for the lavatory, all the time swearing in Gaelic, retching raucously and emitting great gouts of mixed banana wine, Tuborg lager and fermented Coca-Cola? All I know is, he wasn't the same man for the rest of the convention. 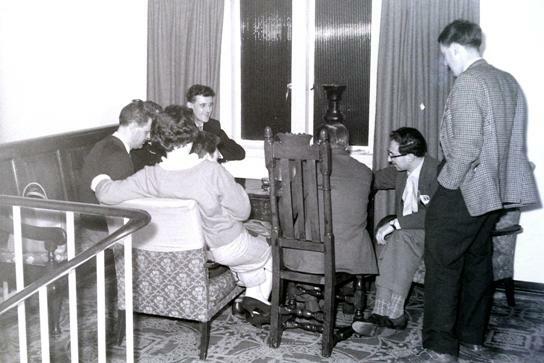 Ella Parker, Arthur Thomson, Ian McAulay, Sadie Shaw, Bob Shaw, unknown on floor.